As a parent (I live in London with my two children), I realise you need to know and have trust in the doctor seeing your child. Here I talk a little of my background. 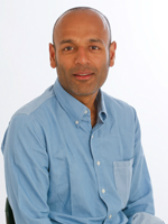 I have been practising medicine for over 25 years, and have worked at consultant level for thirteen years. My clinical practice encompasses all areas of paediatric and adolescent endocrinology and diabetes. Thanks to the unique training culture within the NHS, my clinical experiences have been rich and varied. I have been lucky enough to work in several specialist centres across the country, and have seen a huge numbers of children with both common and complex endocrine conditions. My experience includes managing patients from all cultures and backgrounds, and I'm proud to offer everyone I see the same level of service. As well as my clinical duties, I am research-active, and I use this as an evidence base in my clinics. I see children and young people quickly and efficiently and only request investigations and start treatments if absolutely necessary. As a parent myself I understand the importance of being friendly and approachable, and in providing clear, jargon-free explanations. I trained at Leeds University Medical School where I received an honours degree in medicine (1991). I went on to train in paediatric medicine in London (1996) before specialising in paediatric endocrinology and diabetes in London and Oxford (2004). I was awarded an MD with commendation for research undertaken at Cambridge on the subject of the hormonal determinants of microvascular disease in type 1 diabetes (2006). Subsequently, I was appointed as a consultant in paediatric endocrinology and diabetes, initially at the Royal Manchester Children’s Hospital (2005), then at St Barts and the London Hospitals (2010). I am now proud to be at Great Ormond Street Hospital as consultant and honorary senior lecturer (2012). I have been invited to speak at numerous national and international meetings, and have received several awards during my undergraduate and postgraduate training.